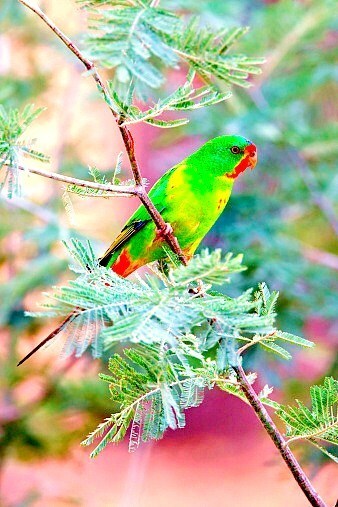 The swift parrot is a small, slim, fast-flying bird with pointed wings and a long pointed tail. Its Latin name discolor means ‘of many colours’, and indeed this parrot is brightly coloured. Overall it is a bright grass green shade, with a red beak. There are patches of red on the throat, chin and forehead, with yellow bordering these areas. It also has red on the shoulder and under the wings, and blue on the crown and wings. In flight this species is distinguished by its striking red underwings. Adult females are slightly duller in colour, most with a prominent cream under-wing marking, and juveniles have pale orange bills and dark brown irises. Another distinctive characteristic of this parrot is its call. It is fairly noisy, especially when flying, when it makes rapidly repeated clinking noises.